While TV fans often decry Fox for putting series into their graves before they’ve hit their prime, Showtime kind of has the opposite problem, letting formerly fantastic shows linger on the schedule until there’s nothing left for them to do but implode and become caricatures. 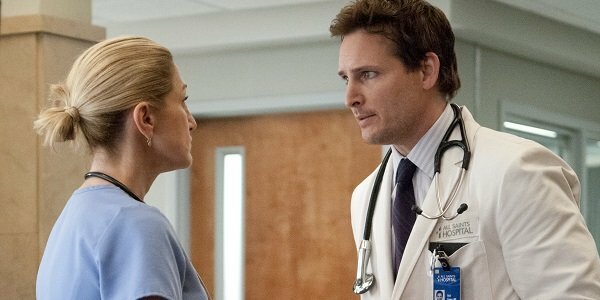 The addiction-based medical dramedy Nurse Jackie will soon become the network’s resident senior as Showtime will bring it back for Season 7, and it looks like Edie Falco’s titular anti-heroine is in deeper trouble than ever before, and without one of her most familiar coworkers. Warning: Season 6 spoilers ahead. According to E!, Season 7 will be largely without the rampant self-assertion of Dr. Fitch “Coop” Cooper, as actor Peter Facinelli has opted out of returning as a series regular. Showrunner Clyde Phillips said the Twilight franchise star “asked to be released from his contract to pursue new creative challenges.” (Itself a sign that the show has been on the air too long?) But it won’t be a clear severing, as Coop will return to Nurse Jackie in some capacity next year. Will he run away with Dr. Carrie Roman (Betty Gilpin)? No news on her leaving, so maybe not. The trailer above mostly shows us moments from the past season, in which the pill-popping medical practitioner Jackie has come very close to having her re-addiction re-revealed. Everyone already knows that she used to be addicted, but her NA meetings and vague change in demeanor are enough for most of her family and coworkers to believe that she has kicked her worst habits. Someone who really understands is her sponsor Antoinette, whom Jackie recently played for an alcoholic fool; actress Julie White (Transformers) is confirmed to return next year. Tune in to Showtime tonight for Nurse Jackie’s Season 6 finale, titled “Flight,” and tell us where you think the series will go next year.